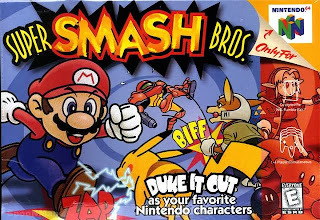 Super Smash Bros. is a 2D crossover fighting game starring twelve of Nintendo's most recognizable characters. The game was developed by HAL Laboratory, maker of the Kirby games, and released around the world in 1999. It's definitely a better game with more players, but it's still a very solid fighting game, especially with all the risks taken with their innovative style. The story is a rather ambiguous tale, with there being virtually no plot. However the game gives just enough for it to be open to interpretation, with each players thought on the plot being varied. Is it about a kid playing with his Nintendo toys? The Nintendo characters fighting a seemingly omnipotent being? Everyone just goofing off and rough-housing? It's hard to tell, but the speculation is enormous. I think that this story type makes the game more interesting in general, but it isn't necessarily a good plot as there isn't a true plot attached to it. It's mostly just a tacked on excuse for Nintendo characters to battle, which is common in fighting games, but the storyline isn't the most important part. This is the most important aspect of a fighting game, and Super Smash Bros. has one of the most unique fighting mechanics in the genre. As noted, Super Smash Bros. is a 2D fighting game, but it's mechanic for winning revolves around ring outs after doing damage to help as opposed to the general health bar depletion that is normal for fighting games. It's a very unique mechanic that's supported entirely by the games creative and wonderful stage designs. The ten stages are almost entirely based off of classic Nintendo games, such as a stage for the original Super Mario Bros or The Legend of Zelda's Hyrule Castle stage. The only one not based off of a Nintendo franchise is the Final Destination, which serves as the final boss stage. The stages do subtly help make the game, as if they weren't so well designed, the games unique fighting mechanic would crash and burn. 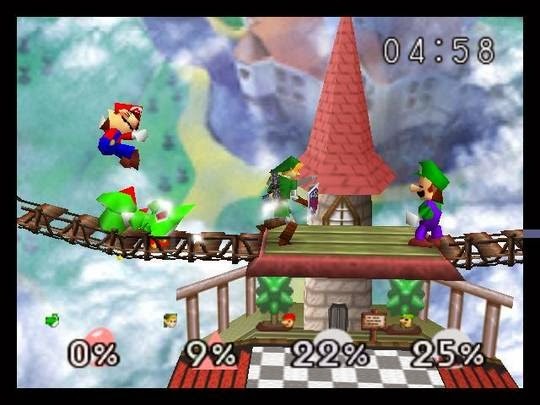 The other core gameplay mechanic that makes Super Smash Bros. so addicting is the multiplayer. Needless to say, multiplayer requires multiple people, so the game isn't as enjoyable by yourself. The single player aspect is enjoyable, but lacking in content. You can do almost everything in a single day, and then all that's left is practicing for when you play with friends. It kills time, but the game is much more enjoyable with friends. That's the only real issue in the gameplay though, and it's a minor issue considering the popularity of Super Smash Bros. Besides that, it's very nicely done and the time spent playing with friends will be uncountable. There are twelve total playable characters, with the variety in the roster being nicely done. Many of Nintendo's core franchises have a representative in the roster, with a few surprises being thrown in the mix such as Captain Falcon from F-Zero or Ness from Earthbound. There were a few noticeably missing characters such as Bowser, but the game does have a memory limit and it chose many representatives for different franchises (eight different franchises in total for the twelve character roster) as opposed to over-populating the game with one franchise. It's a great roster for the first game in the franchise, and it allowed for the roster to be expanded upon without making the game less fun. The control is very simplistic, but effective. As an N64 controller isn't set up for proper fighting games, with there only being two action buttons as opposed to four, the game gets by due to taking advantage of the control sticks capabilities. The control stick is both used for the running, jumping, and attacks, but it isn't difficult to operate thanks to it's surprisingly fluent control. It moves seamlessly, and it works greatly off of the consoles controller. As expected, since it's a console exclusive, but it still deserves praise for how it works with little issue. Now, it's not perfect, as it can get annoying returning to ledges when there is no jump button as the control stick does everything and the D-Pad taunts, but for the first in the series it pulls off what could have been a confusing control scheme very easily. 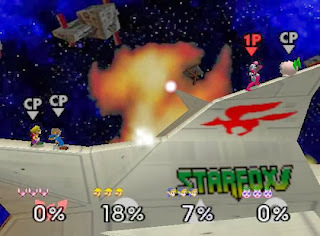 Super Smash Bros. has some of the best graphics for an N64 game, and each character model matches up to or surpasses the models in their respective games. Link looks more refined than he does in Zelda: Ocarina of Time, Mario looks far better than he did in Super Mario 64, or any spin-off released at the time, and so on. Each character is very well animated and are as detailed as they can be. The stage designs are also well done, with each one clearly representing their original franchises (like the aforementioned Super Mario Bros. stage) and are also well designed. The items are all nicely done, and the Pokemon deserve special mentioning for each looking incredible and, save for one or two, look as great as they can. They even look at least as good, if not possibly better, than they do in Pokemon Stadium, which hadn't been released at the time. My only gripe about the graphics is how bland some of the mini game stages look. The "Break the Targets" stages look okay, but have a blank black background for each character, and the "Race to the Finish" game is almost entirely gray. However, that's a very small nitpick compared to how well done the overall graphics are. The sounds are absolutely amazing. They give the game more power, they give players a sense of nostalgia, and they're a great delight to listen to. Each stage has the full song for whatever title they're representing, each character makes the appropriate sounds for their attacks, as well as a generally humorous sound they occasionally make when they are knocked out, and each song is worthy of being listened to on its own, with or without stage. They also do a good job of making each one of the few dozen items have individual sounds, such as each Pokemon's cry or the Hammer from Donkey Kong as it delivers a world of hurt onto every poor unfortunate soul it comes in contact with. The only re-used sound I can think of is Luigi's special Up+B attack, an uppercut of sorts, making the same sound as the baseball bat, when each respective attack is used to it's fullest potential, and that's only due to them both being to represent an attack that seeks to kill a player immediately so it's forgivable. Due to console limitations there can only be one song per stage, but they pick the right songs for each stage. Overall, the sounds and songs of the game are just perfect. Buy it. The original cartridge is expensive, but the game will be played for hours on end with friends and family. If you just want to enjoy the game without spending the additional money on the cartridge, it is available on the Wii Shop for 1000 points (ten bucks). Either way, this is a must have game for anyone looking for an addictive and exciting multiplayer game, and the only reason to pass it up is if you and your friends don't play fighting games of any variety, and even then I recommend you try this game out. Super Smash Bros. managed to take an extremely experimental idea and make it into one of the top five best games on the N64, and it's one that can be enjoyed by just about anyone. It's addictive, it's fun, it's fast paced but easy to learn, it's an amazing game with very few flaws. If you have the ability to purchase this game in one form or another, it's definitely worth your time. Just make sure to invite your friends over to play it with you, or you may eventually get bored fighting computers non-stop.